Tax seems a negative word, but in Twentytú we have created the solidarity tax. What does it mean? When making a reservation in our hostel we will allocate € 1 to an institution of your choice. Being supportive will not cost you anything. IRes foundation: This organization was founded in 1969 and works on social, psychological and educational care of marginalized people and groups with social risk or economically disadvantaged. Sant Joan de Déu: Created in 2002 to cover their research activity, on the biomedical and social field, in different centres as the Mother and Child Hospital in Esplugues, the Parc Sanitari de Sant Boi de Llobregat and other institutions. This project doesn’t take place only here. In Twentytú we believe continuously on collaborating and involving other companies to join us with these or other charitable initiatives. We have been given bicycles to groups with high risk of social exclusion attached to the IRES Foundation too. And we will continue working to expand aid, and to add new ones. Remember to do your donation when receiving your email booking confirmation 3 days before your check in the hostel, in your stays in double rooms. Thank you! If you’re in Barcelona from 18th to 24th September you’re lucky: Barcelona parties are coming. The biggest festival of the city offers a lot of free activities for all tastes and ages. Note down all the highlight acts and concerts of the Mercè 2015. Here’s the full schedule of the party so you can download it and find all activities in this link. Opening parade: City giants are dressed for the occasion, and next to Eagle City, the Dragon and other prominent figures stroll through the center of Barcelona. Castells (castles) party: if you haven’t seen one of the Collas Castelleras de Catalunya in action this is the perfect moment. This unique tradition in the world leaves no one indifferent. Sunday at 12h in Plaza Sant Jaume. Piromusical: Lights, music and fire. These are the three ingredients for this show that every year surprises with its spectacular water dance. It’s the last act of the Mercè festivity and takes place the 24th Thursday at 22h, in Plaza España (Spain square). Buenos Aires is the guest city this year. If you love the tango dance and the Argentina culture you will be able to enjoy circus performances, the new cinema of Buenos Aires and tango in Ciutadella. Children have their own party. The council thinks on families and this year has been dedicated to Castillo de Montjuïc circus. There are small theaters, workshops and games around different city corners. And don’t miss out the music! BAM is the music festival and this year, on its line-up, includes Crystal Fighters, among others. There are also free concerts of catalan groups like Els Amics de les Arts, Mishima or Delorean. For classical music lovers there is the Symphonic Orchestra of Barcelona and National of Catalonia playing. Barcelona is well-prepared for receiving tourists with any type of disabilities. Museums, beaches, parks or means of transport are properly adapted for all. If you have some type of disability and you don’t know where to go on holidays, maybe Barcelona is your next destination. The city’s main attractions are adapted for everybody. In almost all museums there are audio guides for visually impaired or blind people, there are descriptions written in Braille, tactile elements for everyone or for blind people, and some other services. Gaudi’s buildings are one of the main tourist destinations at the city and they are fully adapted for people with disabilities too. You can make a tour in sign language, and touch scale model of the building on 3D to understand itsspecial architecture. Summer is the perfect time to go to the beach! In Barcelona the main beaches offer an assisted bathing service. To help people with disabilities getting in and out of the water there are: a crane for people who need to transfer from their wheelchair to the floating wheelchair or shower, floating wheelchairs, pairs of water crutches and wheelchairs. Transport is one of the most important elements for a tourist, and for disabled people it is even more important to know how to move around in an unknown city.The Barcelona metro, Tram, FGC and bus are almost fully adapted. There are some stations that don’t have all facilities for people with wheelchairs yet, but there are alternatives. Barcelona has an adapted taxis net, and it is compulsory for them to accept seeing eye dogs. Twentytú is the only hostel all over the city which is completely adapted for those with special needs. We offer adapted rooms for people with reduced mobility, that are wider and include adapted bathrooms. You’ll find every information you need about accessibility in Barcelona on this website. The ECOtrendy wave has reached fruit juices and ice cream. In Barcelona small stores and ice cream shops with BIO label are appearing all over the city. Today we show you the best fruit juices and ice cream shops. You should try an ice cream or yogurt from this store on Gracia’s neighbourhood (Torrijos st 21). These products are healthy, low in sugar and with all the delicious flavour of the fruit. They also have lactose free, sugar free or gluten free products. This Italian ice cream shop offers gluten free, low-fat or fat free ice cream. And also they have vegan sorbets. All of this is produced following traditional methods and they use only the best ingredients. You’ll find them at Enric Granados St., 15. This Sicilian ice cream shop is close to Twentytú on Poblenou’s neighbourhood (Rambla Poblenou 123). You can try their artisan-style ice cream made only with Sicilian ingredients. They are also well known for their Italian desserts such as tiramisu or pannacotta. Delicious! This spot on the middle of la Boqueria is famous for their vegan dishes, and also for offering fresh fruit juices with the best ingredients. You can drink their juices at the terrace, or take them away and enjoy while you walk around the city centre. This is one of the best locals in Barcelona to drink a juice or ‘horchata’. Since 1920 they serve this drink on a traditional way, and it is famous for its delicious taste. If you decide to visit this place take your time because it is always crowded. This vegan local is close to the Ramblas and it also offers natural juices. Every day they buy the fruit on Boqueria market, and they make delicious juices, shakes and smoothies with soy milk. The best thing is that many languages are spoken there, so you will feel at home. August is the prime holiday month to visit Barcelona. The city is emptier and you can visit most of the places with more peace. Discover the best places to visit in Barcelona. There are a lot of possibilities to watch a good movie on different places. In Montjuic for example, there is the most famous program of outdoor screenings. There, you can have a picnic while you enjoy a concert and later at night, we can watch a movie. There is also a big screen at Sant Sebastià beach. Don’t forget the towel! You should visit the different squares on Gracia neighbour the first days of August. The best is to drink vermouth or enjoy a dinner in one of its terraces. From the second half of August, Gracia district is a must-see because of its neighbourhood party. Colourful streets and lots of concerts take place during this week. But we warn we that is full of people. This is one of the biggest parks of Barcelona, and unknown too for most of the tourists and neighbors. If you feel full of energy, put your trainers on and get ready to see various plants and flowers while you enjoy the best views of Barcelona. Start the walk on the Child with a ring square Ask for it, people will know it! (Plaza del Niño Del Aro). The building of Barcelona’s University, located at the city center, has a lot of history. You have an opportunity now, on holydays, to enjoy without students the charm of making a tour on this emblematic place dated on 1871. Read our post of free Museums in Barcelona to get more ideas. Barcelona is the third most photographed city in the world according to Google. It’s easy to get lost across its streets and take a special and unexpected photo. Discover the top 5 most photographed spots, take note and upload your own photos on your Instagram. This spot is the most photographed on Barcelona’s ranking. The colors of the emblematic ‘trencadís’, or the nature that impregnates its doors will captivate you. If you want to see a different perspective of Barcelona, get off at line 3 Vallcarca station by subway. From there you can get into the park through not so busy tourist arrivals. Keep on going up until you find the three crosses. Once there, pick up your camera and take a panoramic photo of the city from this place. We don’t leave Gaudí yet. At second place there is the Casa Batlló, right in the city center. The circle lines of this house will surprise from outside, but don’t miss the chance to take a tour inside the house. You’ll make hundreds of photos, and pay attention to the windows and the stained glass. And now the pictures of Casa Batlló have prize: there is a photo contest for those who publish their photos with the hashtag #casabatllo and #photocontest. You can learn more on this link. The Pedrera ranks third in the list, and it is set on a wonderful corner right at Paseo de Gracia. We are sure that you have a lot of images of this place, so we recommended you make a nocturne visit. You’ll see how the colors give life to the soldier-shaped chimneys on the roof. The Sagrada Família temple is the fourth most photographed place in Barcelona. So you thought it would be on the first place, didn’t you? Anyway, you see that Gaudí created the most important places in Barcelona. In this case the cranes appear on all photos. But the recent reforms of the central chapel have filled Instagram of awesome colorful pictures. Go and try to get your special photo. This is the fifth most photographed spot in Barcelona. You are probably wondering why, and so are we. Surely it is the most frequently walked through place all over the city, as it is right in the city center and it is a common meeting point for locals. But we think that this place doesn’t hide any secrets: there’s just a line 1 (red) subway station. we are sure that this place doesn’t have any secret, only there is a subway station of line 1 or red line. If you walk around the city you’ll propably walk by this zone, so don’t stay out! Why don’t you take a photo of this place and post it on Instagram with our hashtag #twentytuhostel? If you come to Barcelona and you want enjoy live music while having a drink… take note of our advice on the blog. There are some small oasis in the middle of the city’s turmoil, where you will be able to disconnect and live a relaxed evening with good music. You choose the partner. In this musical bar located in Gracia neighborhood you can enjoy live concerts or watch an art exhibit, and all of this is accompanied with a good drink. On their program we highlight the small concerts, jazz, underground music and poetry readings. This local at the Olimpic Port and close to Twentytú offers a varied program: Blues concerts, rock &Roll or funk music are the most relevant. It’s a small space design to feel music on a special way. If you prefer jazz, escape to this pub and restaurant set in the purest British style. Fridays and Saturdays they offer dinners with live music, or you can just have a drink while you enjoy the concert. This legendary venue in downtown Barcelona offers concerts or shows every day. A must if you want to mingle with the residents of the city. Punk, Indie, Funk, Rock … and endless possibilities to find the style that suits you. We are positive you won’t easily forget that party. You can also enjoy big concerts on famous locals like Razzmatazz or Apolo Club. Or check the calendar of music festivals on our blog. Come to Barcelona and enjoy the music! With the heat of the summer in the city, the best thing you can do is practise some water sports. So fun and refreshing! But… where can you practise water sports near Barcelona? Which are the most fun water sports you can do in Barcelona? Here are some clues. Enjoy! Who doesn’t enjoy sailing? Feel the breeze on your face and salty smell of the water… Barcelona is a great city for sailing lovers: why not go for a sailing day all over Barcelona coast? You’ll see the city from a whole new perspective and it is so refreshing! Paddlesurf, Windsurf, Kitesurf and, of course, regular surf are some of the water sports you can practise in Barcelona. Although the Mediterranean Sea is probably not the best place to get those perfect, huge waves, surfers can enjoy here too! Another super fun and easy water sport is wakeboarding, which is similar to snowboarding but, of course, on water. A perfect water sport for beginners or children because even if you are not really good at sports you’ll get it quickly and you’ll certainly enjoy it. If you wish to feel as a part of the waves, you can also try kayak or canoeing, at the Sea or at rivers or channels. It is certainly a nice way to enjoy the water in a calmer environment. But be aware that it also requires a huge physical effort if you want to get somewhere! Only for adrenaline lovers! Feel the speed at the sea on a Water Jet Ski or either flyboarding. Not recommended for those who are easily scared … Do you dare? If you are curious about wildlife under the Sea, we recommend a day trip to l’Estartit, a nice spot at Costa Brava with an amazing natural environment. There are plenty of diving schools there where you can either learn how to dive or go for daily routes around the area. Where to practise water sports in Barcelona? Finally the summer sales are here! Certainly it’s the best time to pick up a few clothes and go to Barcelona. The city is a very popular tourist destination for shopping lovers. Do you want to know why? Barcelona streets are filled with trendy fashion shops, and thousands of small ateliers and shops with bold looks. Because of these, and also the many outlet shops all over the city, Barcelona is currently a referent on clothes and complements sale. What do you need to know about sales? People go crazy. If you can, we recommend you avoid the rush hours when people end their jobs after 6pm. That way, you will avoid kilometer-long queues to pay or to go to dressing rooms. Avoid going to the city center. Paseo de Gracia, Portal del Ángel or Ramblas are filled with the major commercial shops, so they are crowded. Discover hidden jewels on small alternative stores at Born or Gracia neighborhood. Customer attention is more personal, and so are their clothes and complements. You will feel unique! If you buy anything on sale and then your regret it, take into account that usually you have from 15 days to one month to return it. Customers’ rights are not on sale! The period of summer sale is from July 1st to August 31st. The big fashion chains offer big discounts at the beginning, and at mid-July they start with 2nd and 3rd sales. The prices are continuously dropping, but if you find something take it at the moment or it will fly away! Try not to get into arguments…please. You’ll find yourself in front of tables full of clothes and items and you’ll feel like Indiana Jones looking for the hidden treasure. But it’s highly probable that someone next to you is looking for the exact same thing. This is not a movie: try not to get in silly arguments! 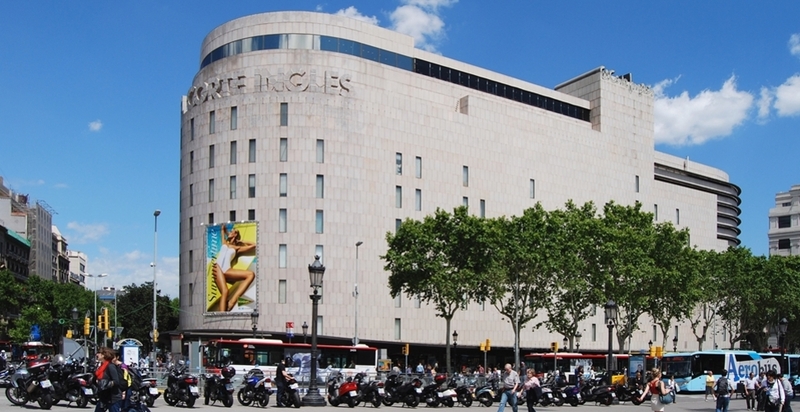 And if you don’t know where to go shopping in Barcelona, check our post Shopping in Barcelona and find out which the main shopping areas are. We hope you will find the bargains you are looking for on this summer sale. Barcelona beaches are now online! Don’t forget your smartphone when you go to the beach… at least when you are in Barcelona! You will need it to check the sea state at Infoplatges App (an app about Barcelona beaches). Good news: with the free wifi network that has been installed all over Barcelona seaside it will be much easier! The city council has digitalized Barcelona beaches. It’s clear that technology is now everywhere and the beach could not go without it anymore. This Summer, for the first time, you can go online for free with the city’s Wifi network. A pilot test was successfully undergone at Nova Icària beach. To be sure of it, you can check information panels all over the city, with tell you about access points to free wifi. Bins underhand with intelligent sensors tell the level of charge and improve the waste collection efficiency. Solar power screens tell us about buses timing. They also have an audio system for the blind. New parking lots for bikes on the sand. In order to turn Barcelona into a more sustainable city, cycling is increasingly spreading and 320 new parking spaces have been created at the beach. Advice or recommendations for users. Report any incident relating to cleanliness, damages, showers, etc. and monitor these incidents, as well as suggesting improvements. With all these new features, you’ll have in your hands all the information about Barcelona beaches. If you don’t know where to go, check our list on The best beaches in Barcelona.